It's that time of the year again when the winds start picking up around here. I could be positive and look at it as a form of resistance training, somehow aiding me and making me stronger. But I'm not going to because I remember how badly the wind burns, especially when it's cold. Wind nips through your gloves and frost bites your fingers off. I'm serious. I'm hoping to run another 4 miles, or 3 because I'm not sure I'll be able to get any running in later this week. I don't like banking "long" runs so close together at this moment, but 4 isn't anything that will hurt me. 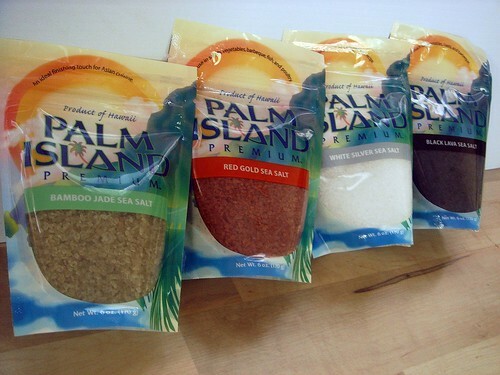 I received an assortment of Palm Island Premium Sea Salts from the company that I've been waiting to review. This is one of my favorite brands of sea salt ever since I first stumbled upon the salts in the grocery store a few months ago. I was excited because the flavors of the salts seemed unique compared to other varieties I know about. Starting clockwise on the top left, we have Bamboo Jade sea salt. Certified organic bamboo-leaf extract is mixed with the salt and has one of the most unique scents and tastes available. The salt crystals are large in size and have a very pretty light green coloring. The suggested use is to enhance Asian recipes. I've sprinkled this salt on top of oatmeal cookies before being baked. 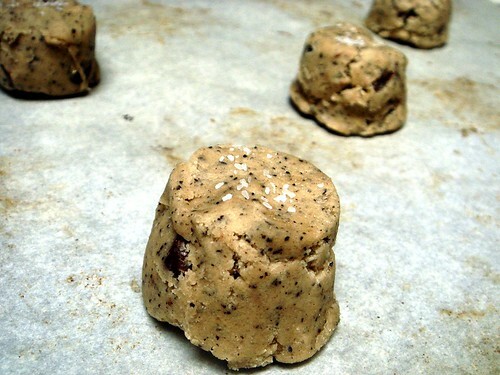 Really lends a unique flavor that takes the cookie from typical to outstanding. Next is White Silver, which is the base for all the other salts. The salt, which is harvested from the Molokai waters, is allowed to dry under Hawaii Kai's original "Solar Seal", their method of preserving the trace minerals present naturally in salt. The ingredients list goes, "Natural Pacific sea salt, premium Hawaiian sea salt, and Hawaii Kai Ocean Essence". The crystals are sparkly and the taste of this one is a bit saltier, but not tinny like most table salts. Red Gold Sea Salt includes the White Silver mixed with rel alaea clay. The clay they select is purified and bonded with the White Silver. The texture is slightly clumpy when you pour the salt from the bag, but the taste is great. This is the salt featured in the recipe I used for the review. 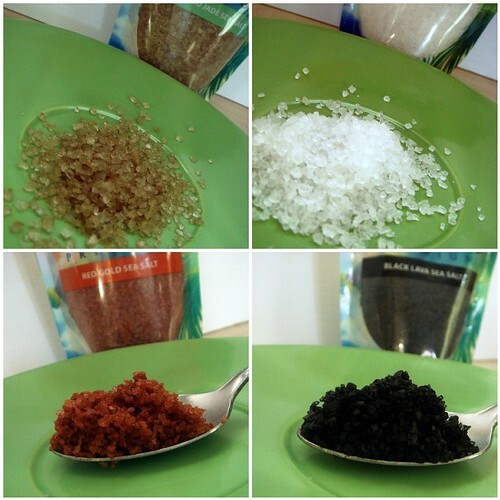 Any of these salts can be used however you want as a finishing salt, you just need to match or contrast the flavors. 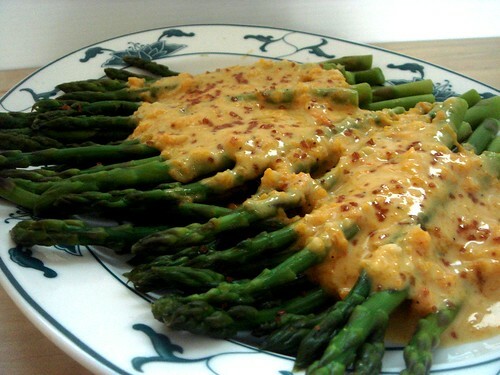 To feature the salt, I paired the Red Gold sea salt with a butternut squash aioli on top of blanched asparagus. I used the same recipe for aioli that I've used in the past, only I omitted the honey and stevia. I didn't have any lemon juice so I subbed white wine vinegar. Also, I doubled the garlic and added a little horseradish mustard. I seasoned lightly with regular flake kosher salt to bring out the flavors, knowing I'd be sprinkling the Palm Island salt on top later. Don't make it too salty! To make this dish a bit more fall-centric, I roasted a butternut squash until tender, then scooped and mashed the flesh. I added 1/2 cup squash to the finished aioli. The light orange color is beautiful! The aioli can be prepared days ahead of time and stored, covered, in the fridge for a while. This is a great way to sneak in more vegetables into your diet as well as using what's in season. Just make sure the squash is roasted completely and mashed smoothly so it blends with the aioli. I always prick the squash with a fork, microwave on high for 5 minutes. This makes the squash easy to slice open. Sprinkle with salt and pepper and stick in a hot oven (375° is what my oven was on) until the flesh can easily be stuck with a fork and scooped. I saw these small, tender asparagus stalks at Martin's and knew that I wanted to do something with them. My goal was to keep prep minimal, so instead of roasting I opted to blanch. Blanching is the process of cooking whatever for a brief amount of time in boiling water, just until the color pops, then removing to a bowl of really cold or ice water to halt the cooking process. The result is tender vegetables that look beautiful and have a snap. Difficult to overcook, really. So I trimmed the asparagus, plopped in boiling water, and it was ready in no time. 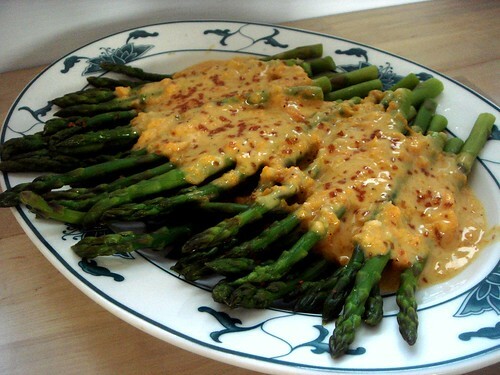 You want to make sure you pat the asparagus dry or else it'll make the aioli watery. All that remained was the finishing touch of the Red Gold Sea Salt, which clearly contrasts nicely against the subtle orange of the aioli. If you see any of these salts at a grocery store near you, don's hesitate to purchase a bag. They're also available online. Both yesterday and today I ran 2 miles. Yesterday's was slower and felt rather nasty, though the sun was out and felt pretty good. Today's run was faster and felt rather nasty, and the sun was not out, plus it was windy and cold. On both runs I focused on taking smaller, for fluid turnovers without overstriding. My left hip feels a little tender but I'm not sure if it's because of the ab stuff I did prior to running, or that I didn't really warm up before running, though yoga will take care of it tomorrow. Back to today, it was 49° and windy when I walked out the door. A brief glance of things to come, things that I'm not too happy about since I dislike running in frigid temperatures. Much of it is because I don't have a good winter running jacket nor gloves that block the wind out. SO MANY RUNS were disgusting last winter just because I couldn't feel my fingers afterward because the wind chill was terrible, and when your fingers start to regain feeling it's so damn nasty that all small children should leave your presence. I saw some cool jackets on Nike's site that I looked at awhile ago, though I'm still looking at what else is out there so if you have any recommendations let me know. Same for the gloves, too. I'm good on the hats and stuff because I knit, so my head stays warm (because apparently you lose a lot of heat from the brain area). Another thing I find myself doing in colder temperatures is running with an iPod. I'm weird. Usually I get into a "song of the day" mode where I listen to the same song on repeat for the entire day, and this ultimately means running with just one song uploaded to the iPod. I actually like it because it gets me into a rhythm better than constantly being aware of song changes. As long as the tempo of the song is good, I'm good. And the reason why this helps me out in the cold is because the last thing I want to be doing is staying outside for longer than a moment. It's a necessary evil to stay in running shape during the winter in time for race training the next year. No, I don't have access to a treadmill. Even if I did I'd prefer to suffer outside, anyway. So with Saturday's 4-miler i'll top out at 12 miles for the week. Good starting point, as this is still the second week of running, and I'll definitely keep those 4 miles slower. Things have been unusually quiet around here on the running front because I haven't been running. Part of the reason was because I probably was a bit burned out, and coupled with the heat and humidity the summer was pretty much dead after the couple of races I ran. So basically a month of no running went by and now I'm restarting in time for the winter. My goal basically is to slowly work up to 25-30 miles by late December/early January and stick with it to February, when I'll incorporate training for half marathons. Right now, I'm working running consistently and focusing on overall fitness. I'm going about 3-4 times a week and doing ab work before runs, then do some yoga at least 2 days a week on days I don't run. Today's 4 miles went by alright, though the loss of fitness and speed is obviously present. However, I didn't regress as much as I thought in the month of doing absolutely nothing so it shouldn't take me longer than three weeks before I feel comfortable running. I was able to maintain about a 9:30 pace the first three miles, speeding up to an 8:30 the last mile. The weather was great and cool, skies on the overcast side. 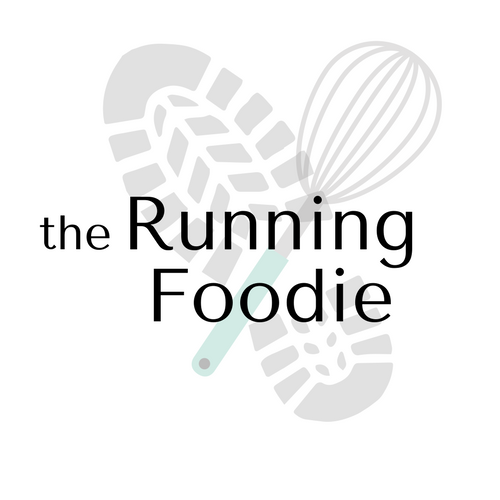 I focused on a forefoot strike and taking smaller, quicker steps, something I've found is most beneficial to my running. I do need to work on actually making sure to run slower, though, as it's always been my tendency to run faster than necessary. So far so good for my second week. I could just stop talking now because, really, by now does a chocolate cake need an explanation? But I did use a different recipe, so I'll talk about that. I've been hearing about the Hershey's chocolate cake, which isn't so dissimilar to the wacky chocolate cake I sometimes make. 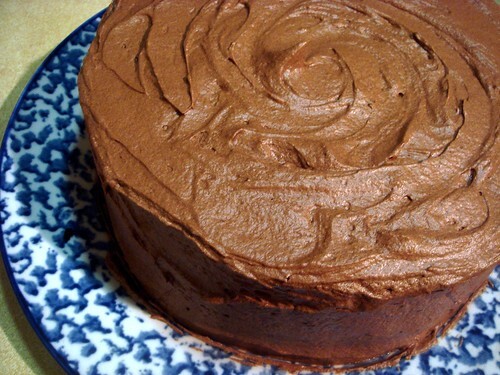 You mix the dry ingredients with the wet, pour into prepared pans, bake, and you get a very moist, chocolaty cake. Can it get any simpler? The recipe I used, though, from a search on Photograzing (I forgot to bookmark the post) was Ina Garten's chocolate cake recipe. It was a bit different from the Hershey's cake with buttermilk and hot coffee instead of just boiling water, but otherwise mostly the same. What I don't understand about Ina Garten is her tendency to bake with extra large eggs. I'm not sure if this emits a feeling of cooking on the farm or if she has stock in the egg industry, it makes no sense. I used large eggs. My thoughts on the cake was that it was indeed quick. However, I feel like these cakes lack a sturdiness when removing from the pan, transferring to the platter to ice, slicing to make more layers, etc. I might decrease the amount of hot coffee I use next time, and I don't think it'll affect the cake much. For the frosting I chose a slightly different flour frosting. This time, the pudding was thickened with cornstarch instead of flour. I melted chocolate chips with the milk to make chocolate buttercream, along with a teaspoon of instant coffee. Unfortunately, the buttercream remained at a heightened state of curdle even after beating the butter in. Even after beating on high for a few minutes. The stuff just didn't want to combine, and I'm not sure if this was because of the chocolate or the instant coffee. 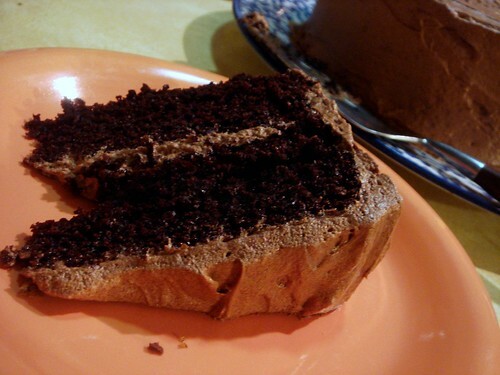 I should have cross-referenced between a different chocolate buttercream recipe. Anyway, it finally became workable after beating in a bit more than a cup of confectioners' sugar and some cocoa powder. Oh well. Everyone liked the texture of the buttercream, as it was very smooth and airy. It paired extremely well with the moistness of the cake and a glass of milk. I'll have a normal post about cake for you tomorrow, promise. Right now, though, I have some knit wire bracelets that are up on my Etsy shop. 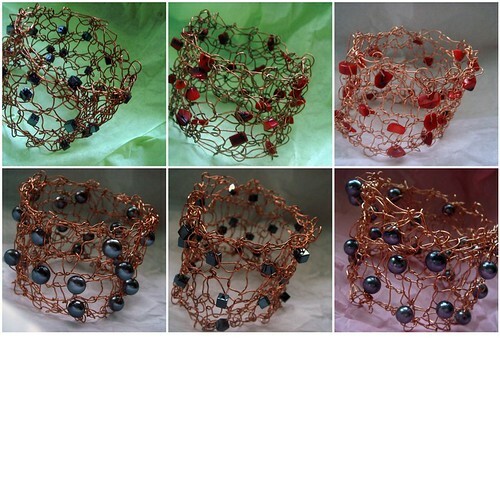 The bracelets, which fit cuff-like, are knit with copper wire and strung with beads. It'd definitely enhance your outfit while being a statement piece. If you have any custom requests, feel free to email. Time for some literary eats. 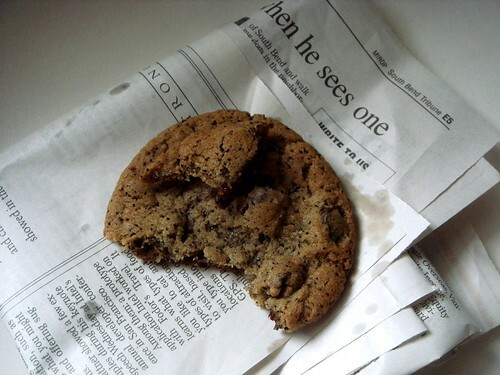 Everyone's been talking about the New York Times Chocolate Chip Cookies since the recipe came out... Two years ago. Better late than never! The concept of these cookies is the extremely long rest time, at least 24 hours and up to 36. 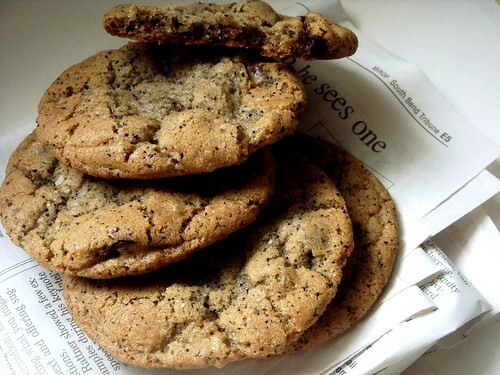 The idea is that the flavors have a chance to meld, giving the cookies an enhances caramel-toffee flavor, and the flour absorbs the liquid to achieve the proper texture in the baked cookie, which is slightly crunchy on the edges that give way to a chewy and tender center. To literally top this off, a sprinkling of sea salt goes on top of the pre-baked cookies to balance the sweet. So you know I like coffee, more so than what's considered normal. Well, I decided to mix ground coffee into the dough to give a better depth of flavor. I was aiming for a chocolate-covered coffee bean sort of effect. I used SBUX Natural Fusions Caramel since the flavor seemed appropriate. I started off with a mere 2 tablespoons. After I tasted the dough, it was just so good that I couldn't stop myself from adding 2 more tablespoons. I knew immediately I went a little overboard because it tinted the batter a shade of gray. Also, while the flavor of the coffee grounds does compliment the cookie (after a 48 hour refrigeration rest), at 72 hours the coffee got a little bitter. So, I would definitely suggest not adding more than 2 tablespoons. My first test batch was proof that these were something special. The cookies came out perfectly round (I used an 1/8th cup measuring cup, flattened slightly, and baked for 14 minutes) and evenly brown. I also didn't have any cake flour so I just used all-purpose, and regular semisweet chocolate chips. These definitely are worth the hype surrounding the recipe, and I will be making adjustments to merge this with another favorite chocolate chip cookie recipe to see how that works. For now, I have more cookies to eat.